In follow-up to the excellent post by Minstrel Boy this week concerning the blow to lesbian/gay rights in California, as well as my addendum and especially all the excellent comments and discussion which ensued, I'm copying in here a letter I just received from Kathryn Kolbert at People For The American Way. She urges all of us to not resort to racism in our efforts to understand this defeat and strategize about what to do next. Let me be clear: Lesbian and gay people in this country are not any whiter than the general population. African Americans who are not gay are no more likely to vote against lesbian/gay rights than white non-gays. Yes, it was definitely people who voted for Obama who also voted against lesbian/gay rights in California, in Florida, and elsewhere -- but to assume those voters were primarily African American is racist, folks. And, it is falling prey to the deeply pathological lie that we are somehow not all in this together, that we must fight over who gets a piece of the pie. To my lesbian and gay comadres, I'll say again what I've been saying for decades -- racism is as much our issue as marriage rights. If you don't have a multi-issue approach toward liberation, you are in trouble from the outset and you will not have my support for your endeavors. The reality is that our human rights have been the flashpoint, the money-maker, the grease on the wheels for the Religious Right for decades now. The Advocate states "the Mormon Church raised, depending on estimates, anywhere from 48% to 73% of the money behind the effort to pass" Proposition (h)8. So, if you want to take an effective stand, get on board the effort to have tax-exempt status stripped from the Church of Latter Day States. One website explaining this option, to stop taxpayer subsidies of intolerance, also has a petition you can sign. The United Kingdom has taken preliminary steps to strip the church of its tax-exempt status. You can support the courageous stance of Mormons For Marriage, who are publicly opposing their church's oppressive behavior. 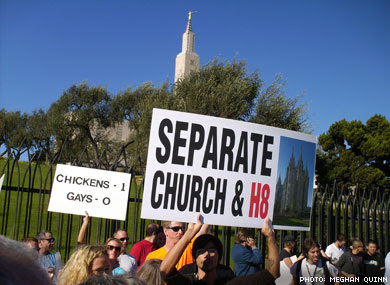 You can join those who are organizing protests outside Mormon temples, as reported in this Advocate article. The National Black Justice Coalition, a civil rights organization dedicated to empowering Black same-gender-loving, lesbian, gay, bisexual, and transgender people. The Coalition works with our communities and our allies for social justice, equality, and an end to racism and homophobia. The Audre Lorde Project, a lesbian, gay, bisexual, two spirit and transgender people of color center for community organizing, focusing on the New York City area. Through mobilization, education and capacity-building, ALP works for community wellness and progressive social and economic justice. Committed to struggling across differences, ALP seeks to responsibly reflect, represent and serve our various communities. "Yesterday, I sent an important edit memo to our partners and members of the media. Similar to the finger-pointing and back-biting going on in some Republican circles over their electoral defeats earlier this week, our side has been engaging in a bit of the "blame game" over the painful defeat of marriage equality in California. With passions inflamed and many people feeling understandable frustration, we must be careful to take stock of strategic missteps and areas where we need to improve the equality movement in a constructive manner, and not engage in destructive scapegoating. "The past 72 hours have brought an extraordinary range of emotions -- great joy at the election of Barack Obama and defeat of John McCain, and sadness and anger at the passage of anti-gay initiatives in Florida , Arizona , Arkansas and California . That sadness has turned to outrage at the speed with which some white gay activists began blaming African Americans -- sometimes in appallingly racist ways -- for the defeat of Proposition 8. This is inexcusable. "As a mother who has raised two children in a 30-year relationship with another woman, I fully understand the depth of hurt and anger at voters' rejection of our families' equality. But responding to that hurt by lashing out at African Americans is deeply wrong and offensive -- not to mention destructive to the goal of advancing equality. "Before we give Religious Right leaders more reasons to rejoice by deepening the divisions they have worked so hard to create between African Americans and the broader progressive community, let's be clear about who is responsible for gay couples in California losing the right to get married, and let's think strategically about a way forward that broadens and strengthens support for equality. "Others have taken on the challenge of looking at the basic numbers and concluded that it is simply false to suggest that Prop 8 would have been defeated if African Americans had been more supportive. The amendment seems to have passed by more than half a million votes, and the number of black voters, even with turnout boosted by the presidential race, couldn't have made up that difference. That's an important fact, but when African American supporters of equality are being called racist epithets at protests about Prop 8, the numbers almost seem beside the point. "Republicans and white churchgoers, among many other groups, voted for Prop. 8 at higher rates than African Americans. There are few African Americans in the inland counties that all voted overwhelmingly to strip marriage equality out of the California constitution. So why single out African Americans? Who's really to blame? The Religious Right. "Please take a moment to read the whole edit memo here. "I won't give up on equality and I know you won't either. People For the American Way and People For the American Way Foundation are already developing the strategies that will make our movement stronger. And we'll need your help. There will be several opportunities in the coming months and years for historic gains in LGBT equality and I know I can count on your support in the fights to come.